Our house has been re-arranging itself this week after a summer of pyjama mornings and staying up too late nights. Half of its occupants have set their alarm clocks, buttoned themselves back into school uniforms, shouted goodbye at a quarter to nine and left behind a trail of cereal dishes and the fading beat of dance music. This was, probably, the final school summer holiday for both of my children. My daughter is in her final year of ‘A’ levels and hopes to go to university next autumn; my son takes his GCSEs next summer and may choose a college to continue his studies, rather than staying on at school. It feels like a momentous moment for me and my husband, Andrew. In the long obstacle-race of parenting, we sense that the finishing line is in sight. I’m not experiencing euphoria or sadness, more of a feeling of a shift in circumstances, a realignment that could, possibly, open up more space, time and opportunities – for me. Every September I always pick up on the ‘back to school’ buzz and think about starting a new course. This year, I’ve signed up again for ModPo. I was one of the (30,000 plus) inaugural students in 2012 ( I wrote about that here) and I’m looking forward to more sessions of reading and thinking about modern and contemporary American poetry. I love the format of this course: texts to read, seminars to watch, and an online community to engage with if I choose. As in 2012, I’m not sure that I’ll have enough time to write and comment on essays – it will depend on my other commitments – but this isn’t a prerequisite of the course so it’s not a problem. Even partial participation in ModPo is really beneficial to anyone wanting to learn more about American poetry, I believe. Plans are progressing smoothly for the poetry workshops and events I’ve organised for Trowbridge Arts at Trowbridge Town Hall. A new Poetry Society Stanza meets for the first time tomorrow, Monday, 12th September and the two workshops I’m teaching start on September 20th. I’ve also set up a collaborative poets and artists event for National Poetry Day, Thursday, October 6th. There’s more info at Trowbridge Arts‘ website and at Town Hall Poets, a mini-site I’ve made for poetry news at the Town Hall. It’s less than one month until I’ll be blogger in residence at Winchester Poetry Festival. I can’t wait to hear some of my favourite poets read and I’m really looking forward to a weekend away! So it’s quite a busy time for me. In between all of this, I’m carrying my notebook and filling it with ideas for poems. I could do with a few, clear, quiet days to sit and write. I know they’ll be here soon. 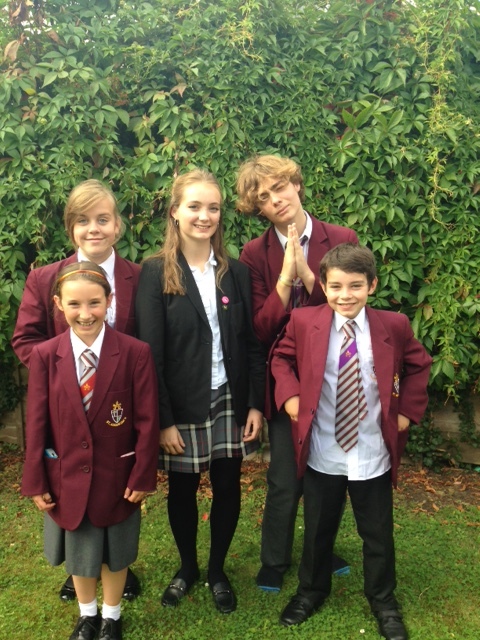 To finish, here’s a picture I took of my children and three of their cousins in school uniform. It’s the first year of secondary school for the youngest two, and the final year for my daughter. For one year only, the five of them will be at the same school together! You have inspired me, Josephine! I have just signed up for ModPo. Will do! Time management is going to be my greatest difficulty. Work at your own pace but try to allow some hours each week. To get the most out of it, you need to set the time aside, at least a couple of hours. I carried my laptop around with me and listened to seminars while I was cooking, last time. Have fun. I’ve signed up for ModPo again, too as I really enjoyed it last time. I wouldn’t have known about it if it wasn’t for you. And Anthony Wilson has just introduced me to Ann Grey. 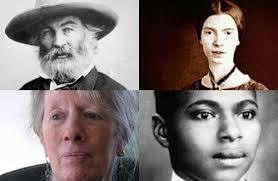 I couldn’t be without these poetry blogs. I learn so much. I love ModPo, but sadly this year will be impossible for me… I too like its flexibility, that you can gain so much even as a lax participant. Good luck to your children in the new schoolyear and have fun with all the projects you are engaged in!